In the construction industry in the US, falls are the leading cause of worker fatalities. Each year on average from 150 to 200 workers are killed, and more than 100,000 are injured as a result of falls at construction sites. Fall protection is a broad term that is used to describe various types of equipment and policies. They help to minimise the potential for workers to be injured when managing tasks that are high above ground level. What does the fall protection standard cover? OSHA has revised its construction industry safety standards and developed systems and procedures designed to prevent employees from falling off, onto, or through working levels, and to protect them from falling objects. The performance oriented requirements make it easier for employers to provide the necessary protection. The rule covers most construction workers except those inspecting, investigating, or assessing workplace conditions, and prior to the start of work or after all work has been completed. The rule identifies areas or activities where fall protection is needed. These include but are not limited to, ramps, runways, and other walkways, excavations, hoist areas, holes, formwork and reinforcing steel, leading edge work, unprotected sides and edges, overhand bricklaying and related work, roofing work, precast concrete erection, wall openings, residential construction, and other walking or working surfaces. The rule sets a uniform threshold height of six feet (1.8 metres), thereby providing consistent protection. This means that construction employers must protect their employees from fall hazards whenever an affected employee is six feet or more above a lower level. Protection must also be provided for construction workers who are exposed to the hazard of falling onto dangerous equipment. Under the standard, employers are able to select fall protection measures compatible with the type of work being performed. The OSHA rule clarifies what an employer must do to provide fall protection for employees, such as identifying and evaluating fall hazards and providing specific training. Requirements to provide fall protection for workers on scaffolds and ladders and for workers engaged in steel erection of buildings are covered in other subparts of OSHA regulations. Why do we need protection from falling? We need protection because even those of us with experience working at heights can lose our balance or grip; we can slip, trip, or misstep at any time. We may think that our reflexes will protect us, but we're falling before we know it, and we don't have to fall far to be?seriously injured. We've been falling since Day One. Until we get better at landing, we'll need protection from falling. How do construction workers fall? 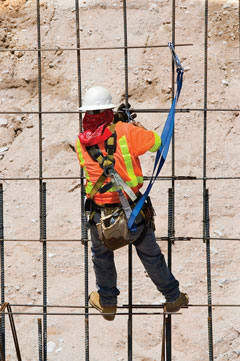 Unless elsewhere provided for within fall regulations, an employer must ensure that a fall protection system is used when work is being done, either at a place where a fall of three metres or more may occur, or where a fall from a lesser height involves a greater risk of injury than would occur from the impact on a flat surface. Following hazard identification, a written programme should be developed specifying how to deal with each hazard. If standardised safe work practises and operating procedures can eliminate the hazard, then such procedures should be specified. Where hazard elimination is impossible, the plan should state what fall protection measures are to be used, how they are to be used, and who is responsible for the overall supervision and training. This programme need not be elaborate but it should cover the basic elements of the plan. All fall protection products fit into four functional categories: fall arrest, positioning, suspension and retrieval. A fall arrest system is required if any risk exists that a worker may fall from an elevated position, and as a general rule, the fall arrest system should be used any time a working height of six feet or more is reached. Working height is the distance from the walking or working surface to a grade or lower level. A fall arrest system will only come into service should a fall occur. A full body harness with a shock absorbing lanyard or retractable lifeline is the only product recommended. A full body harness distributes the forces throughout the body, and the shock absorbing lanyard decreases the total fall arresting forces. The positioning system holds the worker in place while keeping their hands free to work. Whenever the worker leans back, the system is activated; however, the personal positioning system is not specifically designed for fall arrest purposes. Lowering and supporting the worker while allowing a hands free work environment, this equipment is widely used in window washing and painting industries. The suspension system components are not designed to arrest a free fall, so a backup fall arrest system should be used in conjunction with the suspension system. • The duration, extent and type of work to be undertaken; for example, will a visual check be sufficient or is installation or repair needed? If repair is needed, how long will the job take? • What height will workers be required to access or undertake work at? • Training and experience of employees undertaking the work; for example, are trainees or apprentices involved? • The number and movement of people and plant on the work site; for example, are there workers or forklifts nearby that could interfere with fall prevention measures? Do their movements cross paths with one another, increasing the likelihood of a fall? Conditions of work. Is it windy or slippery? If there are poor lighting conditions, sloping surfaces or other hazards above or below a work area such as power lines, impaling hazards or trees, these could all add risk and must be considered when assessing a situation Step four: What safety measures are needed to prevent a fall or minimise the risk? Where the fall height is greater than two metres, the hierarchy requires a duty holder to minimise risk as far as is reasonably practicable by reference to the highest order control measure. Where there is the potential for someone to fall two metres or less the above hierarchy is not a legal requirement; however, it is a useful guide to control the risks associated with such work. Step five: Implement fall prevention measures Where it is determined there is a risk of a person falling from height, a duty holder must implement measures that control the risk as far as is reasonably practicable. This requirement includes providing adequate instruction, information and training to staff. Step six: Ensure emergency procedures are in place in case of a fall Emergency procedures should be in place where physical fall prevention devices are being used. The procedures must enable the rescue of an employee in the event of a fall and ensure first aid is provided to an employee who has fallen as soon as possible after the emergency situation arises. Step seven: Ensure plant and prevention measures are adequate and maintained Ensure any plant being used is designed and constructed for the task at hand and that it can be used safely. Ensure fall prevention devices used by workers are properly maintained and used as prescribed. Step eight: Check risk assessments and safety measures at every site as the situation requires Conditions, equipment, tasks and personnel can change from site to site and while a task is being undertaken, so it is important to ensure work can be carried out safely at all times. Checking assessments and safety measures at each site as and when situations change assists in ensuring a safe work environment. What is your fall protection role? • Employees' role in fall protection plans Employers must prepare a written certification that identifies the employee trained and the date of the training. The employer or trainer must sign the certification record. Retraining also must be provided when necessary so that we can work towards reducing the occurrence of fatalities in the workplace. It’s worth remembering that unless training is documented the employer has no way of ascertaining the success of his/her training programme – beyond the occurrence of an accident. In that sense monitoring and assessing training success, or identifying where improvements need to be made, are vital tools in the process of preventing injuries – or worse, casualites – as a result of a fall from height.